Check this out. Mrs. Greenbean showed it to me over on the Facebook. This morning I had a great time sharing some observations about ministry with the a group of Methodist Men at a local church. Before the meeting started, some wise older man came up to me and said, “That’s a nice beard you’ve got there.” It is wonderful to bump into a bearded Gospel brother. 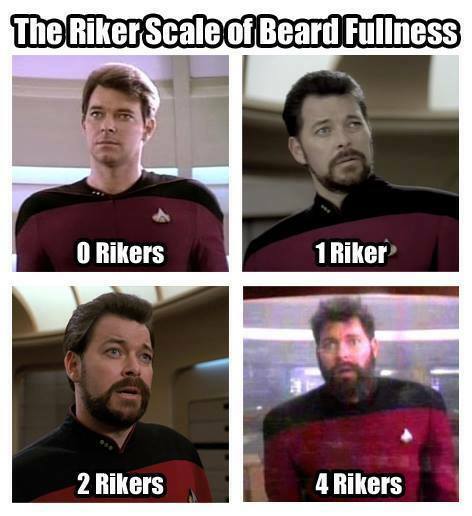 Right now, according to the Riker chart, I am at 1.5 Rikers. My beard is cut short and a little cropped on the side, but is higher on my cheek. Riker’s beard always hangs low on his jowls, where as mine climbs up toward my eye like a vine reaching or the sun. But a week ago, before I cleaned it up a little for the Methodists, I was at a full 4 Rikers. When I trimmed it, small mammals came crawling out. I think I might can get back there before Christmas. Regardless, we can all admit that growing the beard was the coolest thing that William Riker ever did.